Veya kitabı 36800 Kobo Super Points ile alın! While much has been written on asymmetric aspects of sentence structure, symmetric aspects have been largely ignored, or claimed to be non-existent. 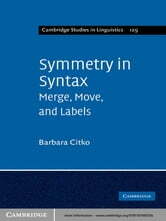 Does symmetry in syntax exist, and if it does, how do we account for it? In this book, Barbara Citko sets out to tackle these questions and offers a unified approach to a number of phenomena that have so far been studied only in isolation. Focusing on three core minimalist mechanisms: merge, move and labeling, she advances a new theory of these mechanisms, by showing that under certain well-defined circumstances merge can create symmetric structures, move can target either of two potentially moveable objects, and labels can be constructed symmetrically from the features of two objects. 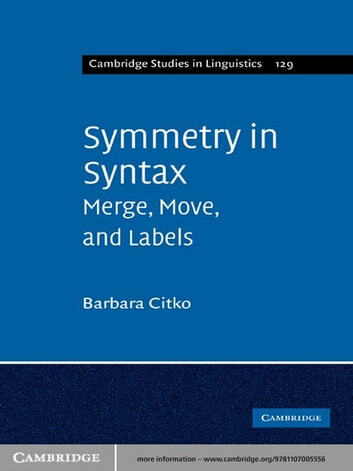 This book is aimed at researchers and graduate students interested in minimalist syntax, the structure of questions, relative clauses, coordination, double object constructions and copular sentences.